I know what you're thinking...wtf?! Steak at Circus Circus?! Really?! Seriously...don't pretend like you didn't think that...cause honestly, I thought the same thing too. Circus Circus is not how it used to be when I was a kid...good fun for kids...I felt pretty safe there...even as a child! No...really! I did! I'd play all kinds of games and win toys and all kinds of cool stuff! But today...Circus Circus has a certain stigma that isn't necessarily super positive. It has a somewhat scary atmosphere sometimes...even driving through the garage, patiently waiting for people to cross the aisle...all the while staring me down like they want to brawl. WTF?! I'm waiting for you to hurry up and get across the aisle so I can keep driving and find a parking space lady! See what I mean?! It kind of makes people a little crazy and puts us into a combative fighting mode! Anyhow...I in fact made it safely to a parking space without being beaten up. I was able to find my way to THE Steak House. Oh...let me back up a bit. Why was I going to THE Steak House? Well, my friends B&D and C&L were in town and B is the ultimate Las Vegas brainiac you can find! I swear...I've been to some of the seediest places...because it was part of Las Vegas history, and B said we need to check it out before they disappear. And you know what...luckily I wasn't gunned down (another story of survival) and I got to experience some very cool things that I never would've known about if it wasn't for B! So...Thank You B! 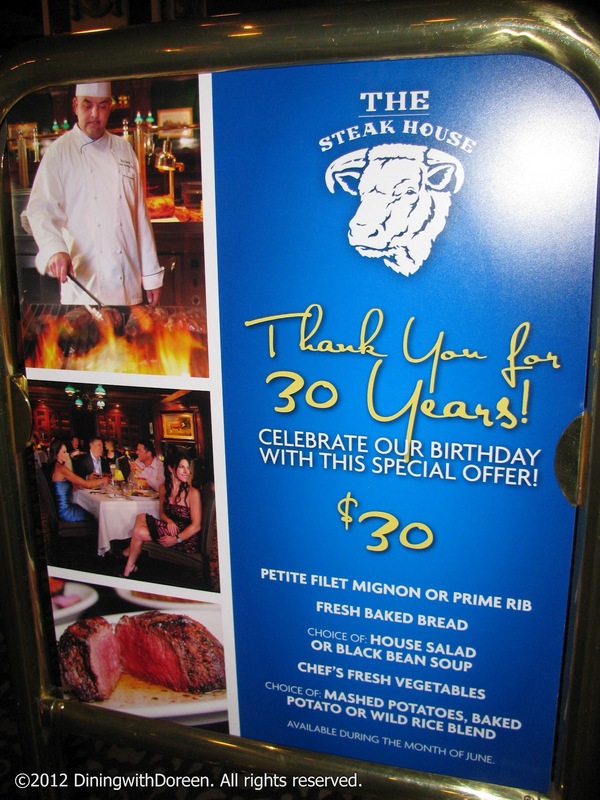 Anyhow...B discovered that THE Steakhouse was celebrating their 30th anniversary so they were doing a special pre fixe menu for....yup! You guessed it...$30! Soup or salad (their famous Cuban black bean soup) and choice petite filet or prime rib. I swear I thought dessert came with it...but alas...it did not. It's ok...probably saved me from consuming unnecessary calories. Again...who would've thought to eat steak at Circus Circus. I mean seriously, I never did. Well, just so you know, they have actually won many awards for best steak from numerous reputable sources!! WHEN you go eat there...check out the front entrance hallway...tons of accolades...I was pretty impressed! We got fresh bread and parmesan lavosh bread! I swear...I love lavosh bread! 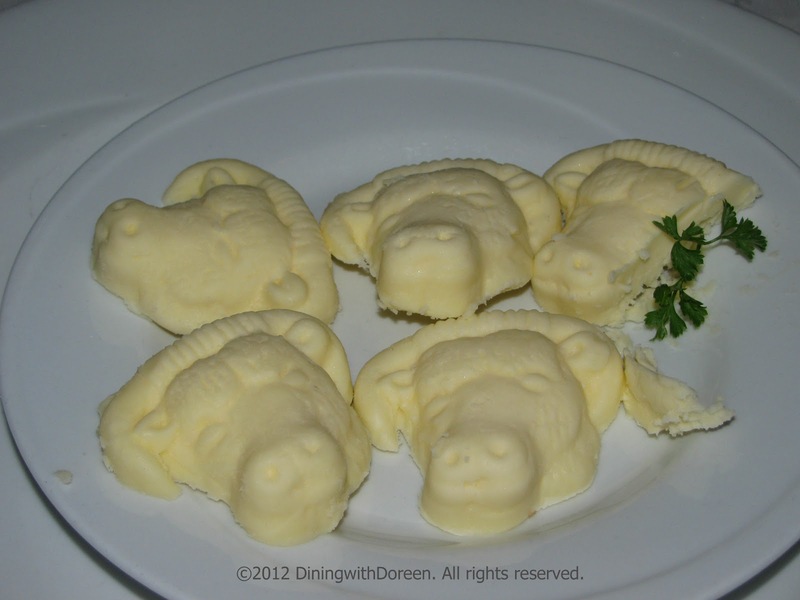 So crispy and delicious and excellent with a little butter shaped into cow heads! Sorry, the poor guy on the right got part of his face chopped off. Hey...someone was ready to have some bread and butter...what can I say! I choose to go with a salad...you all know how much I love eating greens and making sure my body is functioning properly. Everyone else went with the House Specialty Cuban Black Bean soup. 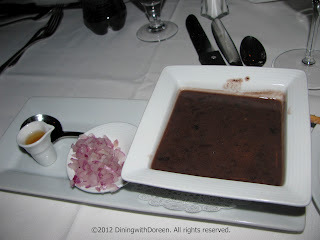 It comes with a little glass of sherry and minced red onions to put into the soup. It did need some salt...which everyone agreed. It was pretty good. 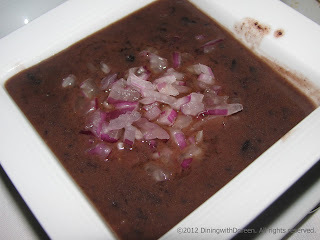 I am not that into black beans, that's also another reason why I didn't get it...but overall, very tasty (with the addition of salt). The addition of the sherry and chopped red onion really gave it a nice little boost in flavor...salt too of course. D got her prime rib marked...which was cool and the piece of meat she had was massive! Nice, tender and good flavor. It was excellent with the au jus and some creamy horseradish. My petite filet was cooked perfectly. For THAT alone...I'd give them 5 stars out of 5! One of my biggest pet peeves about steak houses is when I go to a fancy steak house and they don't cook my meat properly. WTF! You're a steak house!!! Who ever is manning the grill needs to know how to cook the damn meat! OMG...I think that angry woman in the garage has somehow taken over my body! Anyhow..they cooked my meat beautifully to a medium rare that I so love and enjoy. There was a little side of Bearnaise sauce that was buttery and delicious. Straight forward and to the point. Terrific job on the cooking technique...THANK YOU! 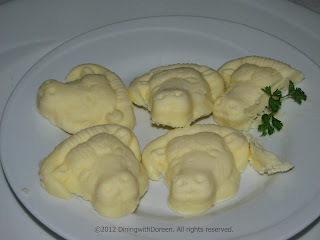 Oh, I also had the garlic mashed potatoes...my only desire...some au jus or gravy...but they were good. Veggies were fresh and not overcooked. Perfect. 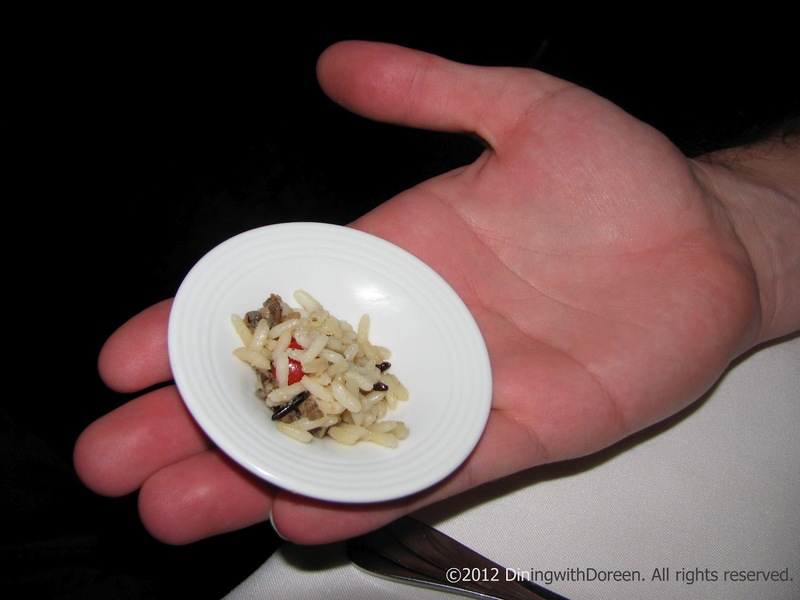 I swear we had a comedian for a bus boy and this was his idea of a side of rice for our friend L. Overall...I was pleasantly surprised and content with my meal. Both the prime rib and filet were excellent in taste, texture and proper cooking temperature. I really enjoyed it. I walked out thinking...I'd definitely come back for another steak or even the prime rib...which I rarely ever get. Since we didn't get to try all the different sides besides the mashers and veggies, I can't speak about them or say how good or not they were. So...you'll have to try it for yourself. 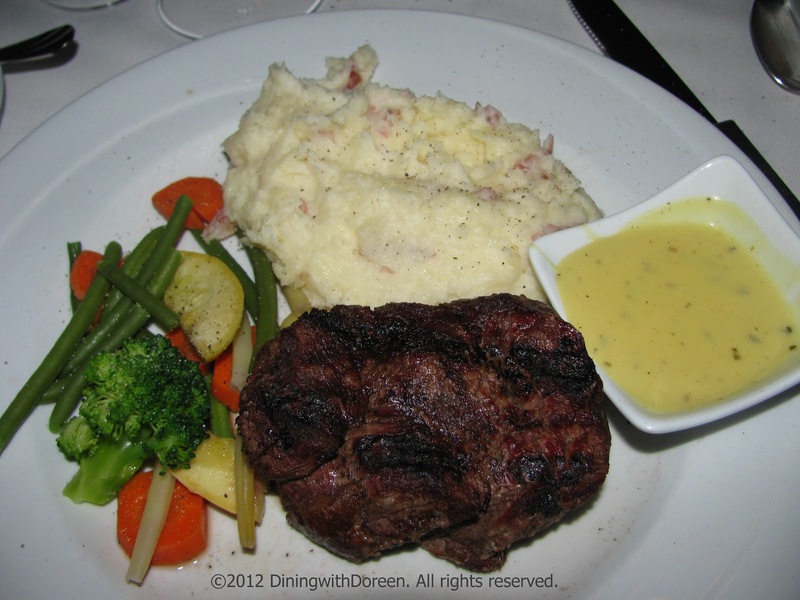 But if you're up to battling the throngs of children and colorful characters...THE Steak House is a great little gem that deserves a try. Thanks to B&D, L&C for the introduction to a steak house I probably never would have thought to try...and for a great evening of excellent company and food. Looks like you had an interesting experience.